If you were to ask me what my favorite cocktail is, I’d be hard-pressed to answer your question. If, however, you were a bit more specific and asked me what my favorite Tiki drink is, then the answer would be clear: the Mai Tai. To me, no other faux-tropical tipple encapsulates the entire genre in quite the same way — it’s true that the Zombie is a pleasingly lethal classic, but it’s complicated and takes a significant amount of effort to make. Navy Grog? Scorpion Bowl? The Rum Barrel? The Fog Cutter? All certifiably Tiki, but none quite so widespread or as infamous as the Mai Tai. Shake all ingredients with the crushed ice and pour, unstrained, into a double old-fashioned glass. Sink the spent half of a lime shell into the drink, then garnish with a mint sprig that has been gently slapped to release its volatile oils. Straw recommended. The drink may also be shaken with ice cubes and strained over fresh, crushed ice. Finally, the 1/4 ounce of simple syrup may be eliminated and the orgeat upped to 3/4 ounce, according to personal taste. Adapted from Beachbum Berry’s recipe in “How to Make a Mai Tai” and Beachbum Berry Remixed. 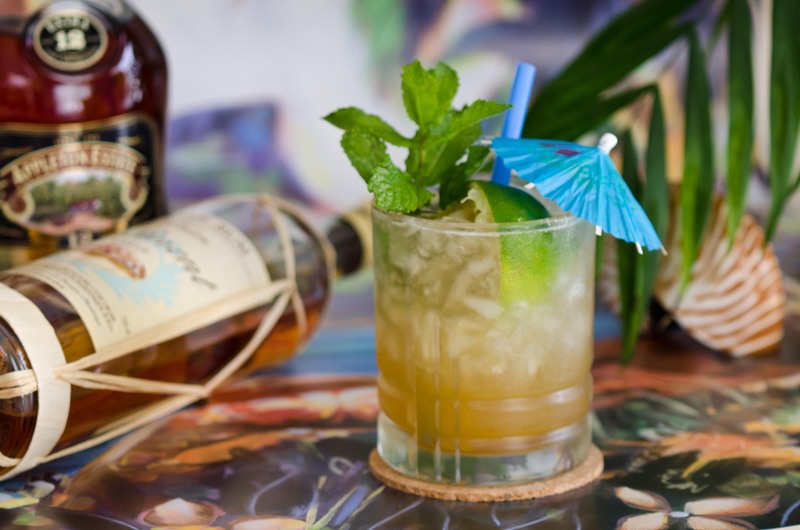 The drink’s balance is spot-on: the two rums play remarkably well with each other, with the agricole providing the oaky, grassy, rustic flavor and the Jamaican rum providing a rich, caramelized depth. The hefty dose of lime is countered by the heavily sweet orange of the curaçao and by the ever-so-gentle touch of flowers and almonds in the orgeat, which has the strange ability to add “tropicality” to any drink that includes it. Top off the whole thing with some fragrant mint freshly cut from the herb garden and you have yourself a great Mai Tai, not to mention a wonderful afternoon ahead of you. Compared to its more heinously complex Tiki brethren (I’m looking at you, Zombie), the Mai Tai is relatively simple: two rums, citrus, and two (or three) sweeteners. The drink’s complexity lies within the selection of its ingredients, particularly the rum. In fact, Trader Vic created the drink to celebrate one rum in particular: J. Wray & Nephew 17-Year-Old Jamaican rum, now extinct (bottles can still be had for untold thousands, however). The story, according to Victor Bergeron’s autobiography, is that one night in 1944, Vic was hanging out with a couple of visiting Tahitian friends. Deciding to create “the finest drink [they] could make,” Vic and the bartender conducted a few experiments behind the bar. Upon tasting the concoction listed below, the Tahitians purportedly exclaimed, “Maita’i roa ae!” which essentially means, “Out of this world! The best!” Thus the Mai Tai was born…maybe. 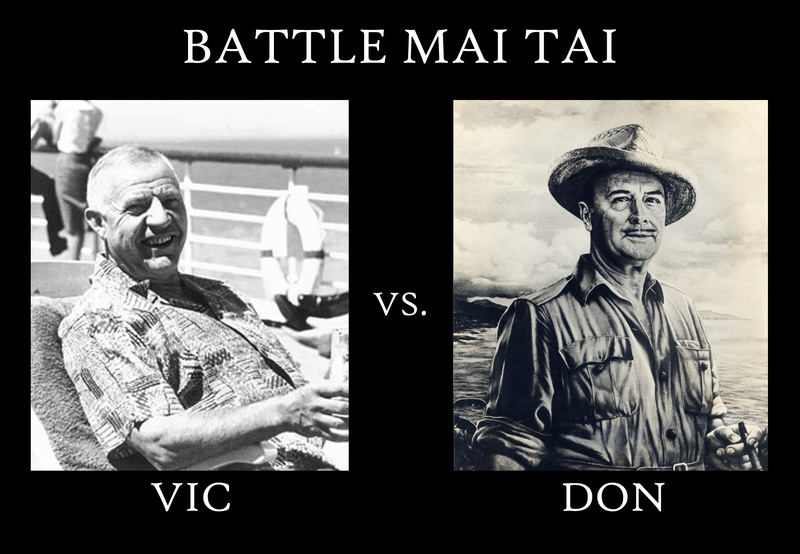 Vic would later have to defend his mythical-sounding claim in a 1970 lawsuit (which he won, by the way) against the Sun-Vac corporation, then the owner of the Don the Beachcomber restaurants. Despite Vic’s victory in the legal battle, Don Beach’s widow, Phoebe, still claims that Don invented the drink in 1933, and that he should be given due credit. To keep a messy history short, Jeff Berry’s research shows that, yes, Don created a drink called the Mai Tai Swizzle around 1933, but it wasn’t one of his favorites. The Swizzle was taken off the menu sometime before 1937, the date of Trader Vic’s inspirational first visit to the Beachcomber, so he never would have tasted one, let alone been able to steal its formula. Furthermore, the Swizzle tastes nothing like Vic’s Mai Tai, so it’s likely that said Swizzle is not The Mai Tai of legend. One of Don’s colleagues, “Mick” Brownlee, says that Don claimed that it was another drink, the Q.B. Cooler, that Vic later appropriated and re-named; indeed, the Q.B. Cooler tastes quite a bit like the Vic Mai Tai, though it contains almost none of the same ingredients. Don’s claim remains rather thin, though he could still very well have been the first to use the Tahitian phrase “Mai tai” on a drink menu. Adding to the confusion is the fact that other Tiki bars adopted the Mai Tai, or at least its moniker, with the hope of siphoning off some of Vic’s and Don’s customers — a common practice in the highly competitive world of mid-century Tiki bars. Recipes were closely guarded secrets and often traveled with bartenders from bar to bar and from pay hike to pay hike (though Don Beach frequently foiled this bribery with coded recipes). While few, if any, imitation Mai Tais managed to duplicate the flavor of Vic’s, the Mai Tai became the Tiki drink — the tropical “Martini” of its day. 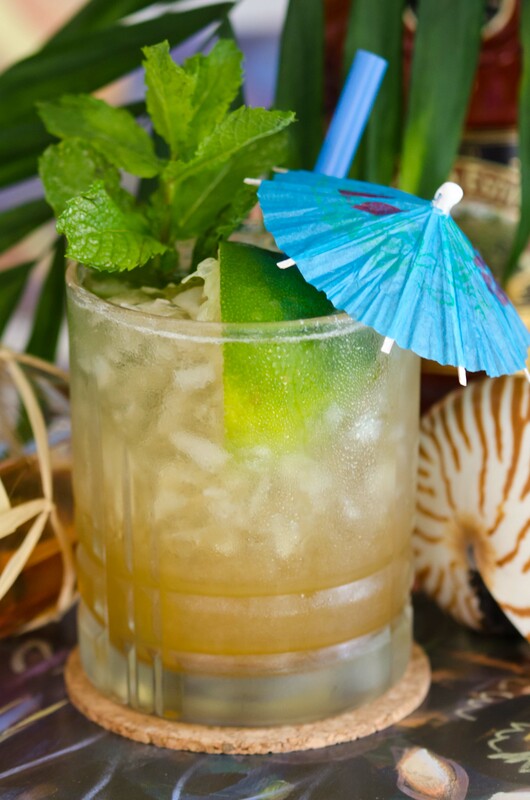 In any case, the faux-tropical wonder that inspired all of the myth and competition was the 1944 drink mixed by Trader Vic, and in my book that means it can be called the “original.” Besides, it’s the tastiest Mai Tai of the bunch. Shake vigorously. Add a sprig of fresh mint. When constructing a Mai Tai, your choice of rum makes all the difference in the world. Personally, I prefer the combination suggested by both Matt Robold (aka Rumdood) and Jeff “Beachbum” Berry: equal parts amber Martinique rhum, which is grassy, oaky, and full of the flavor of sugarcane, and aged Jamaican rum, which is dark, rich, and mellow. The blending of rums is a hallmark of tropical drinks, and the aforementioned combination of agricole and dark Jamaican achieves a complexity that is nigh unattainable in a single rum…with a few exceptions, of course, including the original Mai Tai rum, the 17-year-old J. Wray & Nephew. According to Robold, the agricole-and-dark Jamaican combo was adopted by Trader Vic’s in the 1950s, when the original rum went the way of the passenger pigeon. Sometime later the formula shifted to light and dark Jamaican rums, and then to a custom, bottled blend that went into all of Vic’s Mai Tais. Nowadays, the dual-rum base is standard for the drink, but the rums used often differ wildly according to cost and availability. My very first Mai Tai was made using Robert Hess’s recipe, which is quite good, as it is a simplified, budget-conscious Tiki drink. The dorm room version contained Cruzan Light and (regrettably) Bacardi Gold, with a float of Gosling’s Dark, which gives a nice layered look to the drink. Merchant, in Madison, WI, makes a lighter Mai Tai, mixing Don Q Añejo and Ron Matusalem Platino with their house-made orgeat syrup and curaçao. Feel free to try as many different combinations and formulas as you can, as Matt Robold has done (he’s gone through at least 26 rum blends, if not more by now). Try your first Mai Tai with a blend of Appleton Estate Extra (12-year) and Clément VSOP, however, and you won’t need to sample many other recipes. As far as the other ingredients go, curaçao is fairly easy to deal with: it’s an orange liqueur, sort of a precursor to triple sec, being heavier and sweeter, with a rougher, countrified flavor. The orange color is often artificial, but it lends a nice golden hue to the Mai Tai (the otherworldly blue curaçao that most people are familiar with will turn the drink blue-green). Marie Brizard is my standard, but I also recommend trying a Mai Tai with Clément Créole Shrubb, which has a rhum base. The Clément is nice and rich, with a sharp, but full, orange-peel flavor that works wonders in any Tiki drink calling for curaçao and rum drinks in general. I’ve not tried a Mai Tai with Grand Marnier, the orange-flavored brandy liqueur, but I would think that its brandy base would come off as being a bit heavy — just another combination I’ll have to taste! As for orgeat, it’s the ingredient that is likely to give you a headache (not literally — that would be the rum). For those of you wondering what it is, orgeat is a syrup made from an almonds (and barley, originally) that is often flavored with rose and orange flower water. True orgeat should be subtle and nutty, with delicate floral accents; the cheaper syrups taste like almond extract. If you’re looking to buy, B.G. Reynolds’ syrup is excellent, and is quite similar to homemade orgeat. I can’t recommend Fee Brothers’ product, as it has a distinctly artificial taste and a surprisingly heavy amount of citrus flavor that throws a Mai Tai completely off-balance. I’ve tried making orgeat at home a number of times, and I’ve finally settled on Kaiser Penguin’s “Perfect” Orgeat as my go-to recipe: it’s the simplest and boldest of the bunch, will cost you about as much as a bottle of Reynolds’ orgeat, and will take about 24 hours to make. One tip, though: reduce the toasting time for the almonds, as they tend to burn if they’re in the oven for more than 10 minutes. If you’re looking for alternatives, Darcy O’Neil’s orgeat has made the rounds plenty of times, as has the gorgeously-photographed FXCuisine recipe. Should you be desperate, almond syrup — Torani will be easiest to find — will work in a Mai Tai, but cut the amount to 1/4 ounce and pour in an additional 1/4 ounce of simple syrup. Not as delicate as orgeat, but drinkable. Whew, this post has been thirsty work…but don’t worry, it’s almost done. Should you be bold enough to strike out on your own exotic, rum-fueled quest for Tiki perfection, the properly-made Mai Tai will cost you $100 (but believe me, it’s worth it — besides, you’ll get 25 drinks out of two bottles of rum). One sip and you’ll see why the Mai Tai is the Big Kahuna of tropical drinks. Photos by IJL (Vic & Don photos found on the Interwebs). This entry was posted on July 13, 2012 by IJ Lauer in Clement Creole Shrubb, Drink Recipe, Lime Juice, Orange Curacao, Orgeat, Rum, Tiki and tagged cocktail, dark rum, drink, lime juice, mai tai, martinique rhum, orange curacao, orgeat, original, recipe, tiki, trader vic.